When talking to professionals from purchasing, production planning, and sales & distribution, they often seem not aware how their business operations impact accounting. By the same token, accounting departments are repeatedly left in the dark about business operations during process design phases of major transformation initiatives. This misalignment can be very costly, causing gaps from process design through to business rule definition, and Key Performance Indicator (KPI) interpretation. Business processes are essential building blocks for organisational change and change can only be brought about when the stakeholders share a common goal; aligning on what needs to be done, how it is to be done, and what the implications are, once the work is done. It is widely believed that thinking about business processes from an End to End (E2E) perspective fosters operational excellence since the key process flows, business rules, business roles and expected business outcomes are considered at all levels within the organisation. But Accounting too has its share of rules, legal requirements, roles, and expected outcomes, and often depend on input from upstream processes to ensure optimal service delivery. Keeping this in mind, one clearly sees the potential risks associated with a misalignment between business operations and accounting. To foster holistic organisational transformation, it is essential that all business areas are in sync at the earliest stage of process design. The Value Flow approach facilitates the marriage between value creating processes and their Finance & Controlling requirements. This shall be demonstrated in the following examples. Based on a customer order, goods are issued from stock, triggering a delivery to the customer. When this occurs, the relevant accounting entries are made namely, a posting to Cost of Goods Sold (COGS) and posting of the inventory reduction. 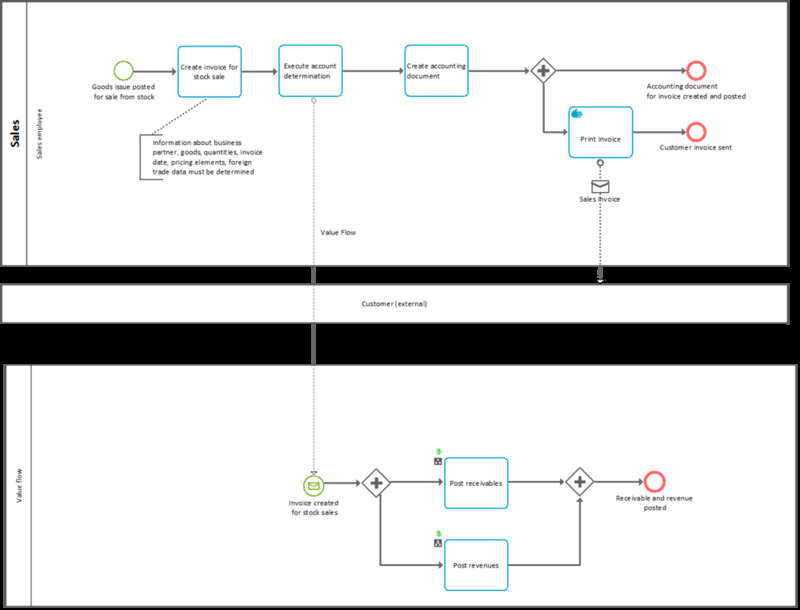 The illustrated BPMN model below visualises this business transaction and the corresponding accounting impacts. In this model, the accounting postings are presented in a separate pool. Once goods have been issued and a delivery is triggered, we expect the customer to be billed accordingly. The creation of a customer invoice will result in the recording of a receivable on the customer’s account, and the posting of the revenue which is derived from the business transaction as shown below. Though the above presented examples may seem simplistic, Value Flow visualisation becomes more complex when considering business transactions among companies from one corporate group. A cross-company sales scenario typically involves a customer, the company selling to the customer (selling entity), and at least one other company belonging to the same corporate group as the seller (delivering entity). Showing the Value Flow for the transfer of ownership of goods, and the invoice creation can be equally challenging and enlightening when considering aspects of materials transfer, cross-company billing, commission agreements, and accounting requirements for balance sheet and P&L account consolidation. 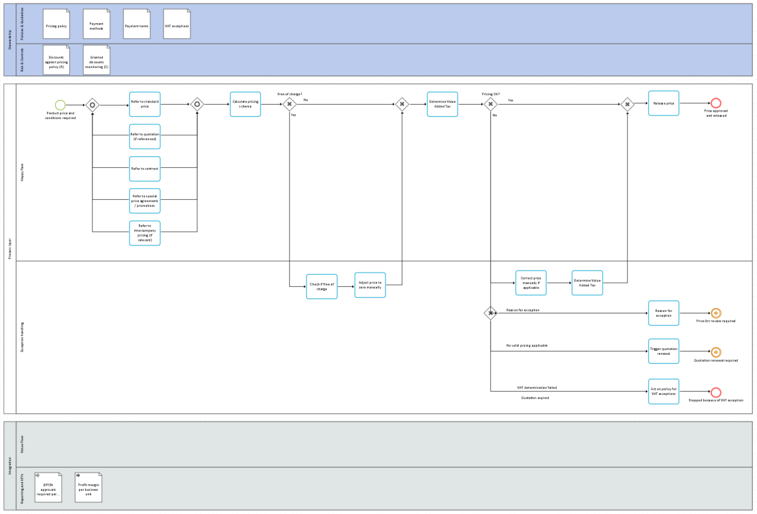 The illustrated BPMN model visualises the transfer of ownership of goods during a cross-company business transaction. When calculating the product cost for manufactured goods, it is necessary to keep detailed track of all incurring direct and indirect costs. To do so, controlling functions must ensure that related costs are recorded and allocated accordingly within the relevant accounting period. Value Flow can be used to visualise the material and time consumption related to manufacturing processes. This provides useful information when aligning the policies and computation method for product costing. The BPMN model shows the accounting impacts when materials are used in the production process. Value Flow representation enriches process documentation by establishing cross references between key Value Flow topics within a business such as COGS and inventory postings, and the various instances and related E2E scenarios. These should be defined at the same point in time as process design with an early involvement of accounting departments. Value Flow therefore offers a framework to ensure alignment between Operations, and Financial and Managerial Accounting in business transformation initiatives. In the next release of Business Flows, we will provide reference models with Value Flow representation for all core business processes. These can be used as a template to refine according to the scope and concepts of your business transformation initiative. For inquiries on the concept and how to establish value flows in your environment please feel free to contact me. bpExperts and Software AG held a joint Webinar on the topic on how process management helps secure the success of SAP projects. Although most companies have realized how important their business processes are for aligning business requirements within IT initiatives there is still a lot of room for improvement on how to exploit the potential across the whole process respective project life cycle. Picking up this topic Joséphe Blondaut from SAG started the session by presenting the ARIS capabilities in the context of SAP projects. Based on this my part was to a present a specific customer use case of a mid-sized company which changed towards a process centric SAP implementation approach using ARIS across the whole process life-cycle. Having a good insight on how the projects were executed before and after the shift, it is a good study on where the major and measurable benefits lay. One main finding is that especially the repetitive character of roll-out tasks within typical SAP template projects (such as site verification, fit/gap, localization and defining roles and authorizations) allow a higher return of the upfront investments into BPM. You can see the recording of the webinar on our Youtube channel. We are looking forward to meeting you there for more videos on our webinars and trainings. You are looking for a change or a new opportunity and have already learned a bit about us on our website? 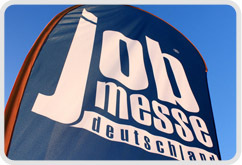 Then it is the right time to get to know us in person at jobmesse frankfurt on 19th and 20th of March! We are looking forward to get to know you and also take the time and give you an insight on the bpExperts working culture. Meet our consultants who will provide tips for your career and honest answers to all your questions concerning the world of consultancy at our company. We are looking forward to meet you at our exhibition stand (stand number 10). And of course we would be glad to receive your application at the fair! Kap Europa, Osloer Straße 5, 60327 Frankfurt a. M.
Follow us on twitter (@bpExperts) to receive impressions and life updates from the event (#bpexperts).